I stared at this watch for most of 2013. You see, I collect the Wristwatch Annual and I usually get it for Christmas or my birthday. The Maurice Lacroix Pontos S chronograph graced the cover of the Annual in 2013 and, therefore, sat face-up on my dresser for most of the year. I was only vaguely aware of the Maurice Lacroix brand, but that was one gorgeous photo on the cover of the Annual. Gorgeous! That watch popped up in a magazine or two and maybe some blogs, but I never saw one in real life. A couple of weeks ago, I was granted the opportunity to buy one. I accepted, on the spot, without even seeing the watch in person. Buying watches sight unseen is risky, but I would be picking it up in person. Plus, I knew the specs, I knew the design, and I “needed” to get a proper weekend sports chrono (on rubber) in my collection again. I was sold. 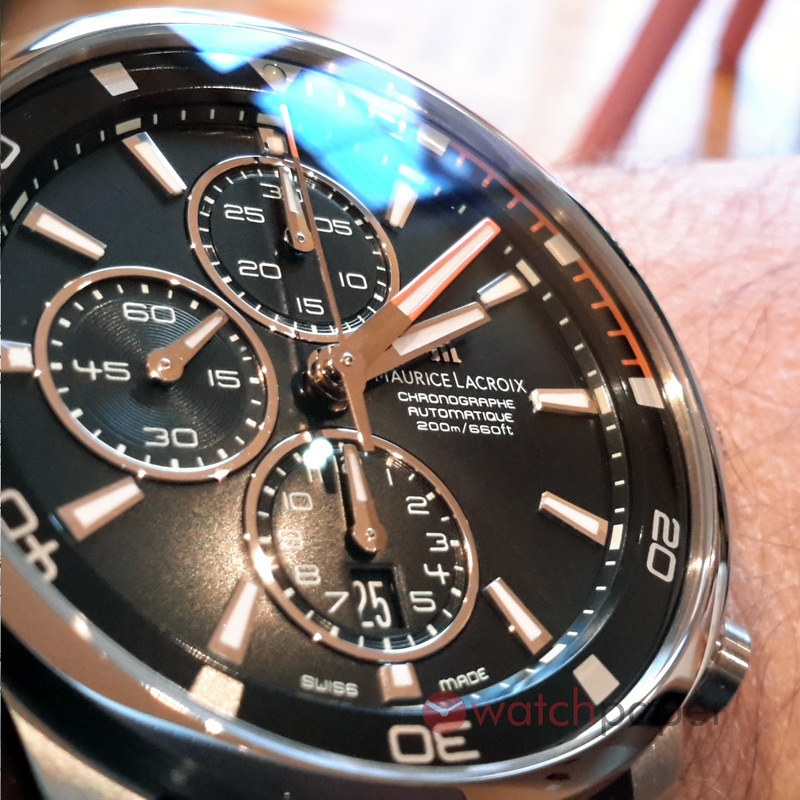 I still knew nothing of the Maurice Lacroix brand, but I trusted that a watch with an MSRP north of $5000 would not disappoint. As I have mentioned in previous blogs, I shoot first and ask questions later. When I see a good deal on a cool piece that fits my “needs”, I rock and roll. Maurice Lacroix are no longer available in Montreal after their AD closed down. But I was getting mine from a trusted grey market dealer — brand new in box, with stickers still on. There is a particular spot in my collection for weekend sports watches and I have had some amazing pieces to fill this role. But I keep trading them because I feel bad about having an expensive watch that only gets worn while I am at the store running errands or taking my daughter to dance class. However, my last experiment in not having a weekend warrior taught me a lesson. I recently found myself without such a piece and I realized that I really “need” a cool piece to enjoy on the weekend. Now that I have plenty of dressy and elegant watches for the office, it won’t bother me that my beautiful Maurice Lacroix only comes out to play on the weekend. My brand new Ponto S has become my default weekend casual piece and will come to the office when I am wearing a shirt with wide enough cuffs to accommodate its beefy proportions. 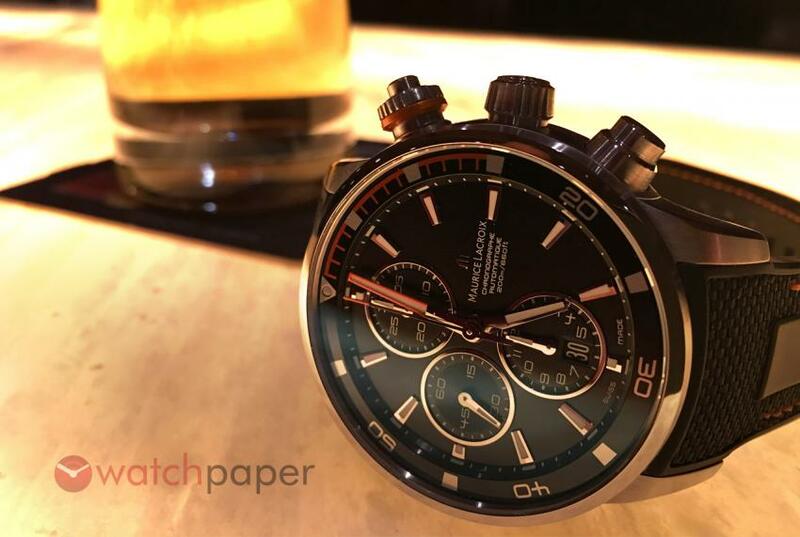 Now, the Pontos S is more of a diver than anything else, which is at odds with my craving for a motorsports chrono. I can rationalize this by understanding that any diver is primarily a sports watch, which will still feel at home at the Grand Prix as well as any summer BBQ. All good divers have a certain rugged feel, which the casual weekend man can enjoy during weekend outings. At any rate, I have a retro Heuer Carrera which is a true motorsports timepiece (albeit a three-hander and not a chrono). I think any collection needs a real diver — not so much for water resistance but for the ruggedness. So I am quite happy having a diver as my go-to weekend warrior. I have read some comments online that the Ponto S has an unremarkable and ordinary style. Whoever made such comments – I would love to see their reference points. If you think my Pontos looks nice in my photos, you should see it up close. It is stunning! 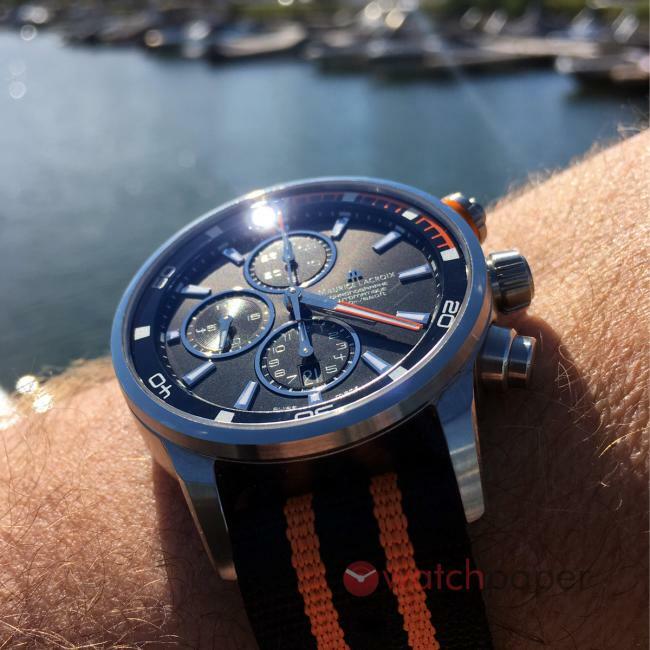 Maurice Lacroix Pontons S, the weekend warrior! 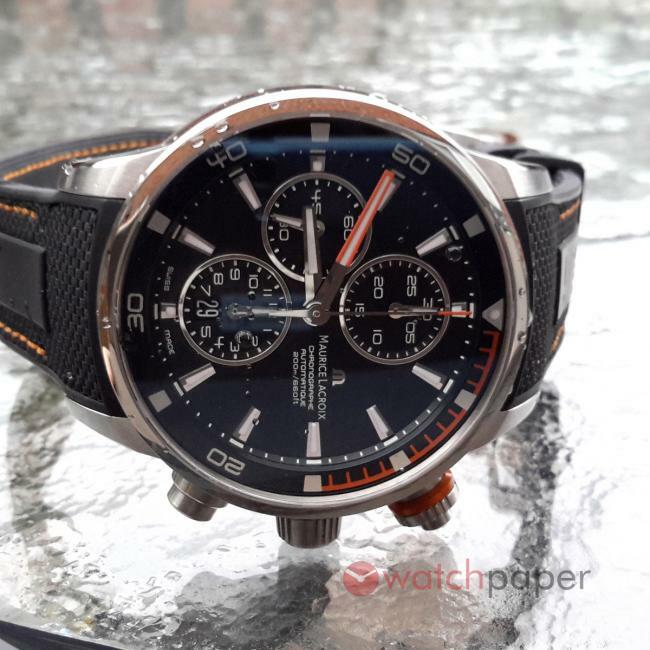 While there is no brand recognition for Maurice Lacroix, my pals have gone gaga for this watch. There is a gorgeous finish to the dial, which gives a really high-end feel. 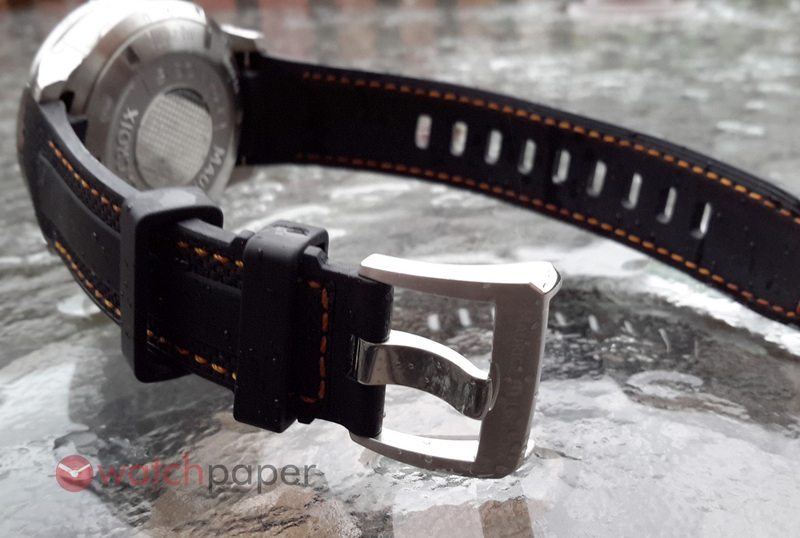 The rubber strap is a masterpiece of design and detail, while the nato strap is really fun and sporty. On the wrist, this is a pretty big watch. I wore it during the heat wave in Montreal, on both straps, and enjoyed fantastic comfort. The performance is good, too. My watch is running at +10 seconds, which is fine. And the power reserve is well over 48 hours. The chrono functions beautifully. My only beef is the inner rotating bezel. To turn it, you press down on the top chrono pusher and then rotate it. This turns the bezel. That’s wonderful. But what happens is that when I actually use the chrono, and press the pusher, it often turns the bezel and knocks it off center. And you know my thoughts on off-center bezels… Apart from that, the chrono is superb. But forget the technical details. Forget the ETA 7750 movement. Forget the brand recognition (or lack of). 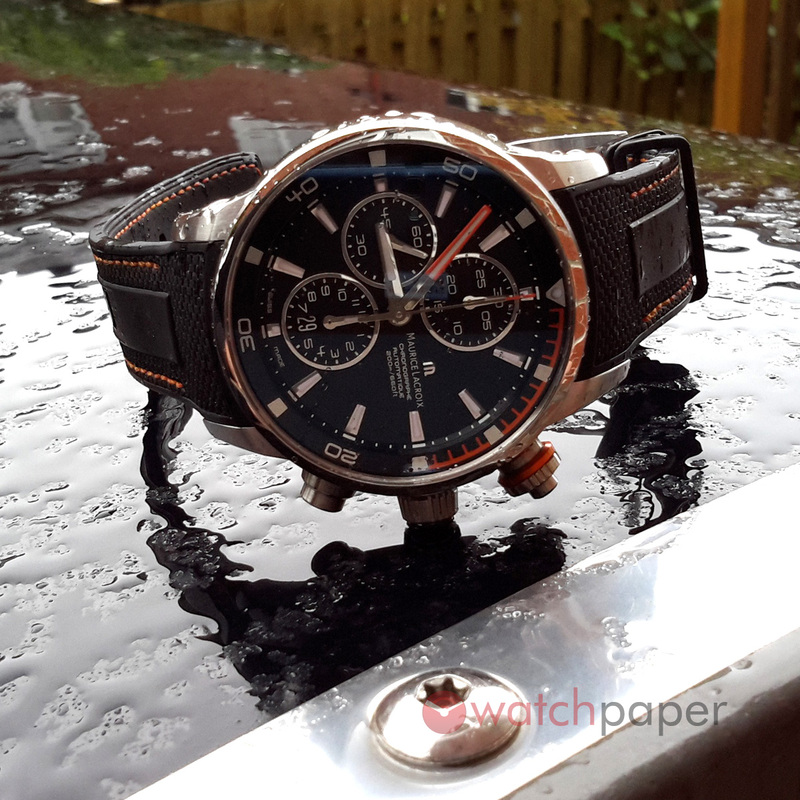 The Maurice Lacroix Pontos S is one stunningly beautiful timepiece. Period. It is utterly gorgeous. It is an absolute joy to wear and is one of the coolest weekend warriors I have ever encountered. The orange accents are tasteful and the watch looks quite contemporary. I have noticed many other beautiful watches in the Pontos category. Perhaps you should take a look.